View Northeast from Ebbetts Peak. This weather page is concerned with providing weather information to hikers and backpackers on or near the Pacific Crest and Tahoe to Yosemite Trail routes through Highway 4 at Ebbetts Pass and Lake Alpine. Thus this page gives good insights about the weather to our North in the Southern end of the Mokelumne Wilderness and to our South in the Northern end of the Carson Iceberg Wilderness. Besides the weather information we will find links to the maps, miles, resupply, permit, and elevations information for the PCT and TYT here, and to our North and South. Let's get out and go backpacking. 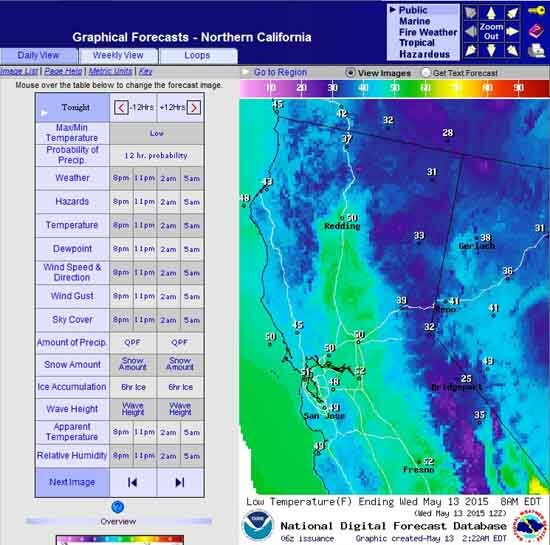 Use this tool to investigate all aspects of the 7 Day High Sierra Forecasts. 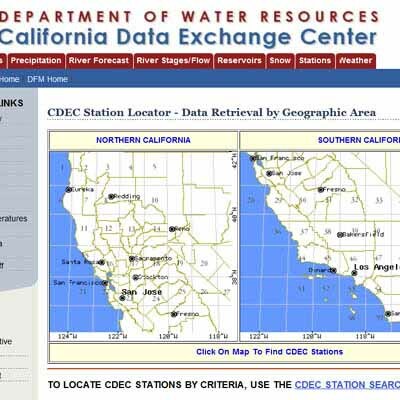 The first link below bring you to an expansive map of MesoWest Northern California Real-Time reporting stations. Click the Red and Black dots on the maps above for Trail Guide and Detailed Map information for the clicked positions, respectively. Focus: Mokelumne River to Spicer Meadow along the TYT. Blue Lakes to Wolf Creek on the PCT. 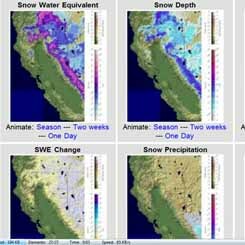 Note: If the California State pages are hanging up refer to the federal MesoWest and Snotel resources. California has problems. All Ebbetts Pass reporting stations laid out on a hiking map. NAD 27. Location: High point on Highway 4. Topo Map. Location: Between Blue Lakes and Ebbetts Pass. See Topo Map. Location: Between Ebbetts Pass and Lake Alpine along Highway 4 on the West flank of the Sierra Crest. Location: West of Pacific Grade Summit on Highway 4 along North Fork Stanislaus River. Location: Highway Four, 15 miles West of Ebbetts Pass. Real Time Ground Reporting Stations Planning our gear selection for our hike South from Lake Tahoe we have referred to a reasonable selection of real-time ground reporting stations that inform about temp, wind, rain, snow, and humidity. 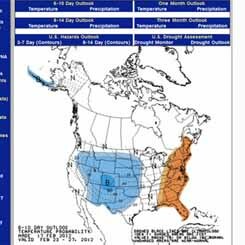 This real-time data gives us both current and historical knowledge of the range of temperatures we can expect to experience at various points down the trail. This information establishes our gear selection range. Fall, Winter, and Spring. Fall, Winter, and Spring. Good for Summer hot & cold trends. This Weather Page, like the trail guide it is a part of, covers the High Sierra Trails across Highway 4 along the West the Sierra Crestline through Ebbetts Pass and along the Western Flank through Lake Alpine.Therefore the trail guide split into two branches upon departing the Lake Tahoe Basin, and continues South along both the Tahoe to Yosemit and Pacific Crest Trails across Highway 4. The Pacific Crest Trail hikes through Ebbetts Pass along the Eastern fringe of the Sierra Nevada Crestline South to Sonora Pass. The Tahoe to Yosemite Trail emerges from its trek through the deep Summit City Canyon and the even deeper canyon of the North Fork of the Mokelumne by hiking over the top of Mount Reba and down to Lake Alpine. The National Forest Boundary runs North and South along the Sierra Crest across Ebbetts Pass. South of Ebbetts Pass we continue hiking in the Toiyabe National Forest, but now we have transitioned from the Toiyabe administered Mokelumne Wilderness into the Carson Iceberg.From Lake Alpine we also hike North or South into the Mokelumne or Carson Iceberg Wilderness, respectively, but the Western sections of these Wilderness areas are administered by the Stanislaus National Forest. West Slope: Stanislaus National Forest. East Slope: Toiyabe National Forest. West Flank of Carson Iceberg Wilderness along the Tahoe to Yosemite Trail, Stanislaus National Forest. East Flank of Carson Iceberg Wilderness along the Pacific Crest Trail, Toiyabe National Forest. West flank of Mokelumne Wilderness in the Stanislaus National Forest. East flank of Mokelumne Wilderness in the Toiyabe National Forest. Ebbetts Pass reporting stations laid out on a hiking map. The Sierra Crest is noted for having the capacity to produce four seasons of weather during a single Summer Day. Rain, snow, hail, fog, lightening, and a bit of sunshine can all happen in quick sequence. The High Sierras are noted for rapid changes in weather and temperature, and the sudden appearance of harsh weather trends. You may experience anything from intense heat to bitterly cold Summer snow storms. Or you may not. In any case, weather must be considered and proper gear preparations made to deal with the range of weather BEFORE entering the High Sierras. Long Distance Backpackers who were on the High Sierra Crest in early August of 2009 experienced just such a series of Summer Snow Storms. Temperatures dropped to the high teens and low twenties, snow and hail fell which partially obscured the trails, and all of those who entertained the misconception that the Sierras only have fine weather during the Summertime were bitterly disappointed. Luckily for the many backcountry travelers who were not properly prepared, those storms blew apart, rather than consolidated and deepened. Weather considerations should guide your gear selection. 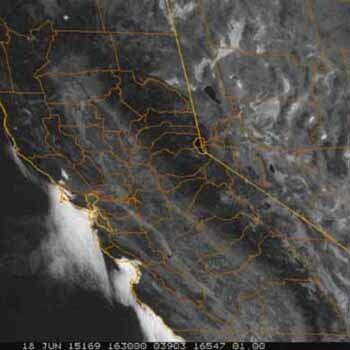 The NWS Satellites will give you an orbital view of potiential storm activity far off the coast of California. 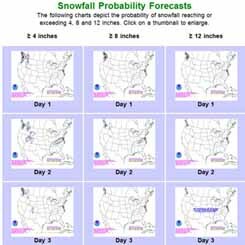 Combined with the NWS Maps and Forecasts, you can anticipate weather. 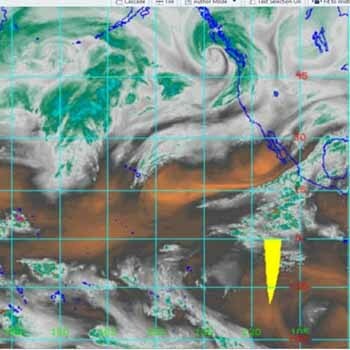 Note: especially check the 28km infrared and water vapor animations. NWS Maps Note: Especially Check the 24 to 48 Hour fronts and Precipitation Maps. 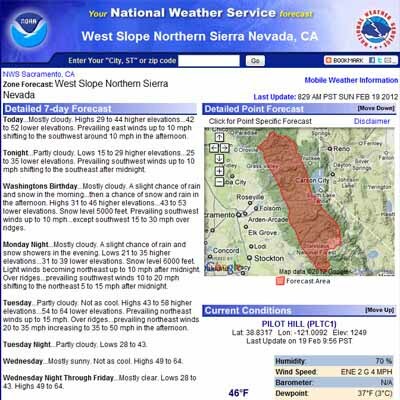 The National Weather Service Home Page displays large and small scale weather warnings which may pertain to your High Sierra backpacking plans. Anyone can post up comments and questions in existing topics posted on the High Sierra Backpacking Trails Forums or in the High Sierra Backpacking Topics Forums. But only members can post up new topics, and can post images and maps with their posts.